Hello everyone! 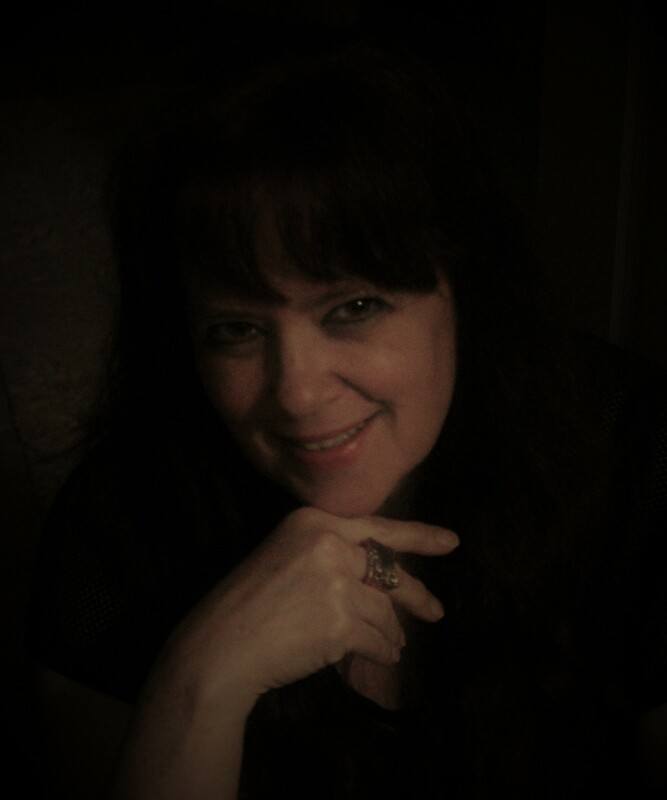 We are pleased to have a guest pub tender for today’s poetry challenge, Jill Lyman. I have recently been rereading How to Read a Poem and Fall in Love with Poetry by Edward Hirsch. In the first chapter Hirsch talks about the relationship between the poet (writer) and the reader. He refers to it as being a form of communication between two strangers, often across time, space and cultures. 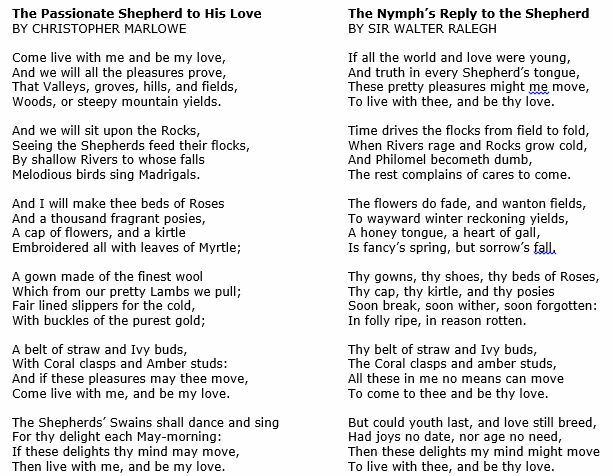 This triggered for me that moment in a literature class when I first read Christopher Marlowe’s famous The Passionate Shepherd to His Love and the response, A Nymph’s Reply to the Shepherd, written by Sir Walter Ralegh a few years later. These two poems take the communication between writer and reader a step further because Ralegh’s poem is in direct reply to Marlowe’s poem. The challenge is to write a poem that is a direct reply to another poem. While Ralegh kept Marlowe’s form and meter, it would certainly not be necessary to do that. I encourage you, however, to test your poetic limits by mirroring the form of the original poem. You may also choose to take the challenge to another level by writing two poems in which you respond to an original poem of your own. You may go humorous or serious, ironic or sardonic, but whatever direction you choose, have fun with it and raise your personal writing bar to new heights! As always, take care to credit the original poem that you are responding to with a source or link that we may continue to protect the work and rights of all artists. Is there a poem that you have always wanted to respond or reply to? Now is your chance! If (Kipling): In which a whining teenager writes a poem about dad’s blathering and how he doesn’t understand me. A Word to Husbands (Nash): A word to wives. Jill Lyman, writer, high school English teacher, photographer, amateur chef, & jazz lover, blogs at Jilly’s Poetry & Photography & Food! Influenced by childhood nursery rhymes and the works of poets like Ogden Nash and Lewis Carrol, she occasionally writes under the persona of Silly Jilly, allowing her to tackle the sometimes tough subject in the camouflaged tone of childhood. Jilly lives with her soul mate husband and fellow writer in Central Florida. Hello my fellow poets and pub dwellers; welcome to Meeting the Bar! I am your hostess and bartender, serving potions, infusions, and response poetry. Glad y’all are here! Thanks so much for the challenge Jilly! Your poem made me laugh – I’m glad you went with that one! Welcome Jill and thanks for the challenge – I do enjoy responding to poems! I also chose a short poem, but that was because I chose one from a ‘poem for every day of the year’ anthology! Happy Thursday all you dVerse poets! Happy almost-Friday – a.k.a – Thursday, Kim! Glad you’ve joined in. Jilly, Jilly, Jilly! I’m jumping up and down with excitement to see you here! What a fantastic prompt – I love it. My pleasure, Frank. Look forward to reading your words! Hey dVersers! Hi, Jilly! Great prompt. I posted earlier, but had to run. I’m here for the evening. Barkeep! A bit of Scotch… in keeping with the bit of rhyming I’ve pieced together. I have a Macallam behind the bar that will set you back a bit – perhaps you can pay for it in verse? 🙂 I read your poem earlier and loved it! Glad you’ve joined in! I’ll take a glass, and see whether the spirit muse hits. Perhaps the Scotch will inspire some Irish lamenting later on. It is my pleasure to be behind the bar, Frank. Glad you’ve joined the challenge. This is gonna be good! Can’t wait to read everyone’s. But first I have to come up with my own, yikes! Too many to choose from. In which I go after Shakespeare and instantly get thwacked with a bolt of lightning. Ah well, being Bard-Thwacked is not a bad thing… I think 🙂 On my way to read! Then strive till in your face you’re blue. Sorry for my late reply. Catching a breath at last after a hectic month. Happy New Year, Jilly! A huge jolly *woof* for the year of the dog. Happy New Year! The Year of the Dog – my own doggie will be pleased to hear that. Early, early morning, my friends. I’ll be around to read during lunch. Happy Friday! Hello Jilly- Thanks for the thought-provoking prompt! My pleasure. I’ll be around to read after school! I could not resist, I had to do a few limericks and poke fun at the president as well. Oscar Wilde once said he could resist anything except temptation. Hahaha! Glad you jumped in with limericks – a great smile source to start the weekend! Happy to make it this week although a day late. Being in the US, sometimes when I look for the prompts in the morning it’s not there yet. That’s not why I’m late though, not blaming the bar! Over my flu and ready to go. I hope no one else has this terrible flu but some of you probably have it’s widespread in every state. Sorry about last time I couldn’t even sit up let alone read but I’ll be around this time. Look forward to it. The prompt was fun but challenging figuring out how to answer the poem. I picked a simple one to make it easier. It was fun! Have a good weekend! Glad you are here and feeling better! A bit early here so I’ll have a coffee please with responses on the side…have read a few already but look forward to the rest. Thanks Jilly for the great prompt! You’ve come to the right place, Janice! I serve a great cup of coffee and we have a variety of poems for your reading pleasure– some sweet, some salty– all excellent. Look forward to reading your words. Thank you for this lovely prompt! It was most fun to see the two poems illustrating, and I had a good time writing my poem. Now I am determined to write a little in English, again! I an so glad to hear that! Your poem is truly well-written and I look forward to reading your future words. There is a war going on, Jilly. The angels are fighting Satan, as prophesied in Revelation. I am “the Girl”, the “wife”, “sister”, and “daughter” of Jesus, and the devil is focusing on me since I am there to get. I love the female. Kindly find the New Jerusalem, created by me, on | trixnix.com |. hey i missed it too, by 15 hours. ahwell. So here’s a thing, i’ve got some bot posting comments to my poems. I haven’t approved them yet, because i can’t figure out why someone would want to do this. Pros and cons?